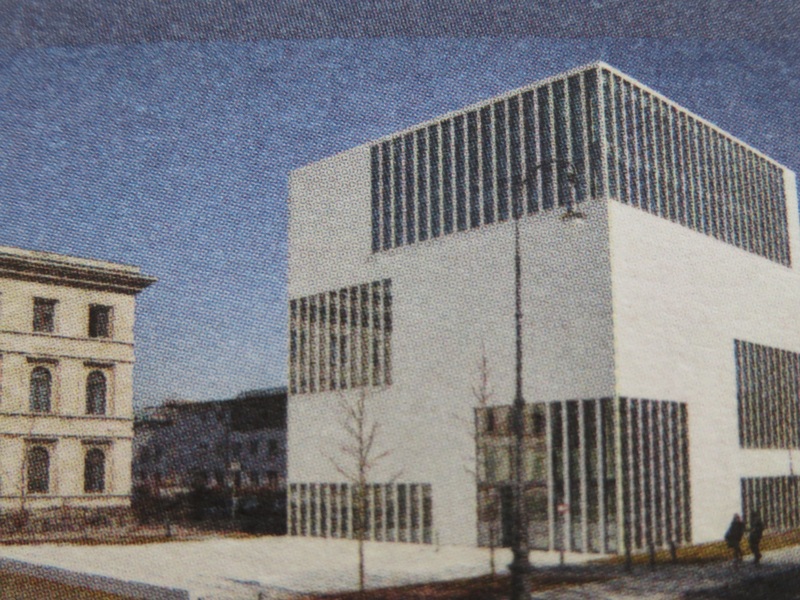 A new museum, the NS-Dokumentationszentrum, opened in Munich on 1 May. 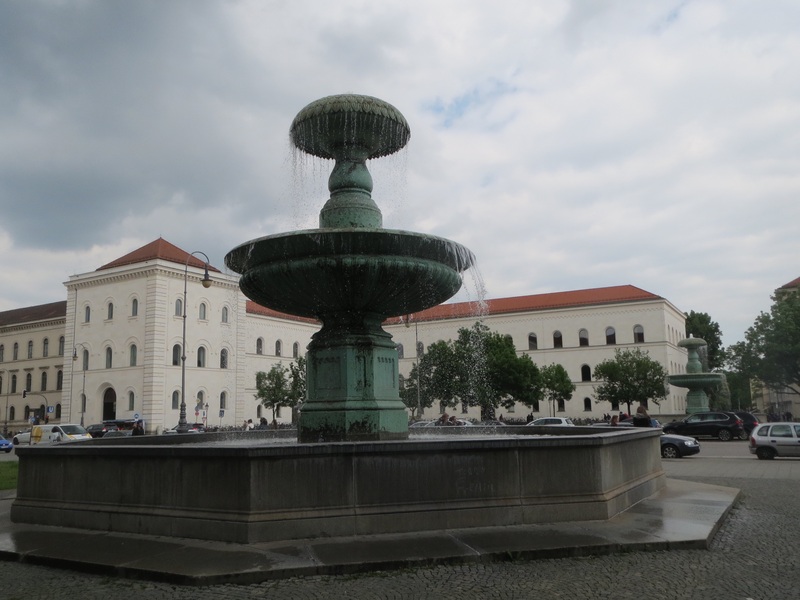 It is controversially built on the site of the infamous ‘Brown House’, Hitler’s headquarters from 1931. This museum documents the rise of National Socialism in Germany and the particular role Munich played as the centre of the Nazi movement. The display features documents, letters, old film footage, posters and interactive displays from 1914 through to the 1950’s. It is excellent and has all information in both German and English. Our exploration of this dark part of Germany’s history together has taken quite some time to happen. Having studied German history in depth between the two World Wars, as part of a modern history major at high school, I felt no real need and Fred being a child in the war, whose father was quite damaged on return was keen to leave that behind too. 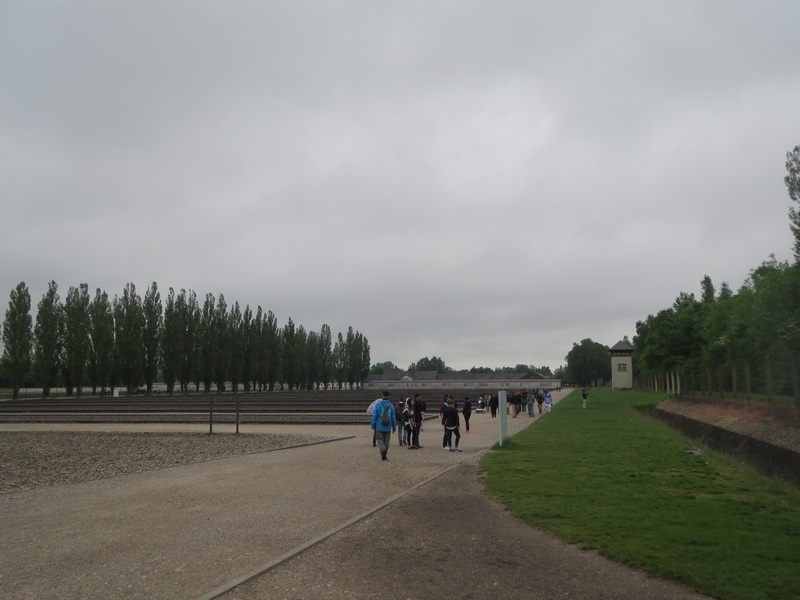 However our recent exploration of both our fathers’ military records and our friends’ encouragement, saw us go both to the exhibition and Dachau. The Dokumentation museum covers the rise of right wing conversative radicalism, following the collapse of the monarchies in Europe after the afirst World War. Many in Germany blamed Wilhelmism (Kaiser Wilhelm and his military) for starting the war in the first place. Germany was only united as one country around the 1850’s with Prussia gaining the upper hand and Bavaria (and the Wittelbach King Ludwig) ceding independence. The Bavarians weren’t too happy about this and being a rich state continued to harbour some independence from Berlin. At the end of the war, the Treaty of Versailles decreed that Germany had to re-pay war debts. The establishment of a democracy in Germany via the Weimar Republic was seen as a good thing, women gaining the vote and free elections, however the crippling war payments resulted in devalued currency and little work opportunities. In 1919 there was a revolution against this democracy in Bavaria, generated largely by left wing and communist elements. Much of the middle class, especially in Munich were concerned Germany would succumb to communism, modelled on Russia and thus became sympathetic to more right wing politically conservative ideals. Included in this group were many business people, publishers and professionals, as well as the military. as a charismatic speaker and was commissioned to spread right wing propaganda first by the German Workers Party which in 1920 became the NAtional SoZIalist German Workers Party (NSDAP). While Hitler’s influence grew in the 1920’s, especially after his failed ‘Beer Putsch’ attempt in 1923, it was obvious that a large section of the Munich business and professional community, including the judiciary were supportive of his views, with an extremely well organised propaganda machine, via the press, film and other media. Other socialist or more moderate groups who protested about racial persecution could not compete. The influence of the NSDAP as a political party grew to such an extent that Hitler was elected Chancellor of the Third Reich in 1933. 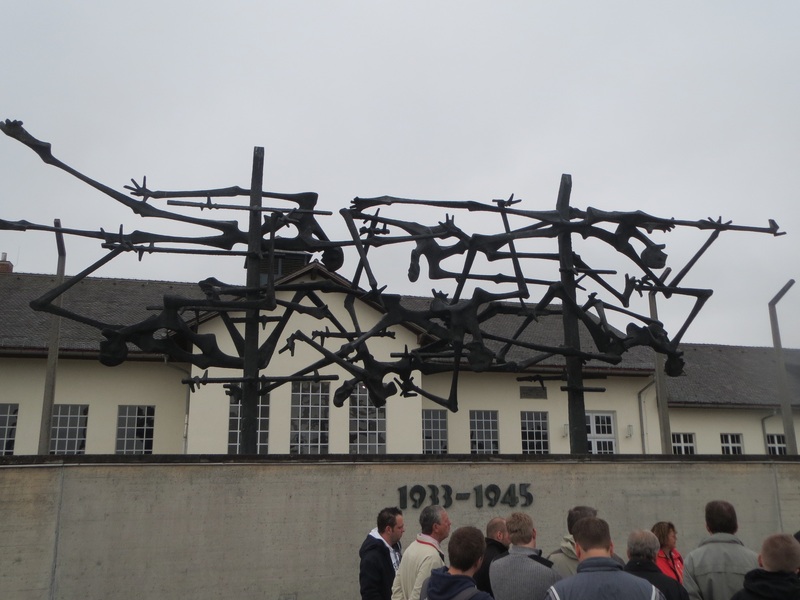 It was in 1933 that Dachau Concentration Camp was established for ‘political’ prisoners. In 1935, the Nuremberg Laws were passed, which isolated Jews, especially but also Roma and Sinta peoples, as second class citizens. ‘The principle of equality for all before law was discarded, which broke with centuries of civilisation in Germany’ as one document put it. The infamous Kristallnacht followed where Jewish businesses were trashed and they and other minority groups, as well as homosexuals, were systematically persecuted by the ruthless Nazi regime. The documents revealed how both the Catholic and Protestant churches colluded with Hitler, even while decrying his policies on inequality. Businesses supplying armaments, such as BMW, pharmaceuticals, such as Merck and even clothing, such as Hugo Boss benefited from the regime. People while frightened of the Gestapo (police) continued to have stability, work and were given financial incentives to remain loyal to the regime and many benefited from the extensive slave labour provided from the work camps. 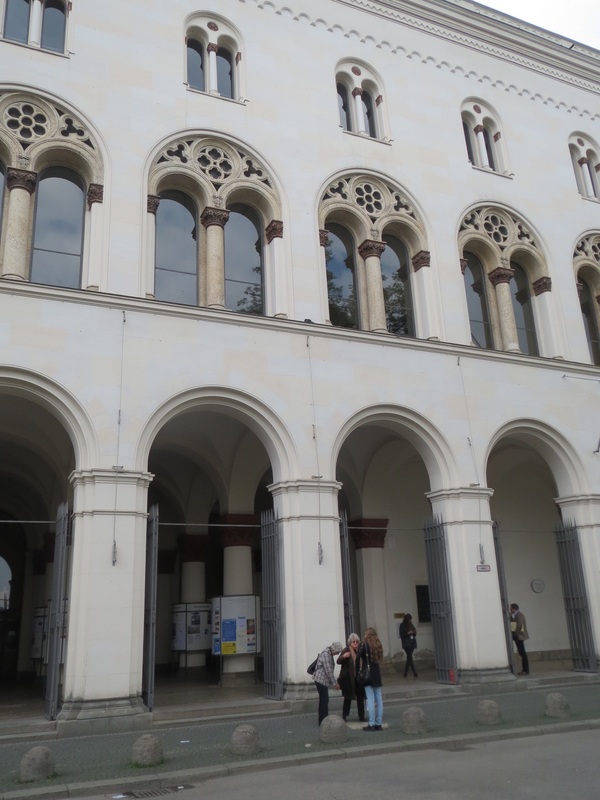 One photo showed women cycling to work past the Feldherrnhalle, having to make the Heil Hitler salute. The most chilling takeout memory was the film footage of the fit American soldiers entering Dachau in April, 1945 and climbing into the rail wagons filled with emaciated bodies piled into one corner. The extent of work and concentration camps extended throughout all the occupied German territories but Dachau of course was right at the perimeter of Munich city, reached now on the S-Bahn in just 15 minutes. 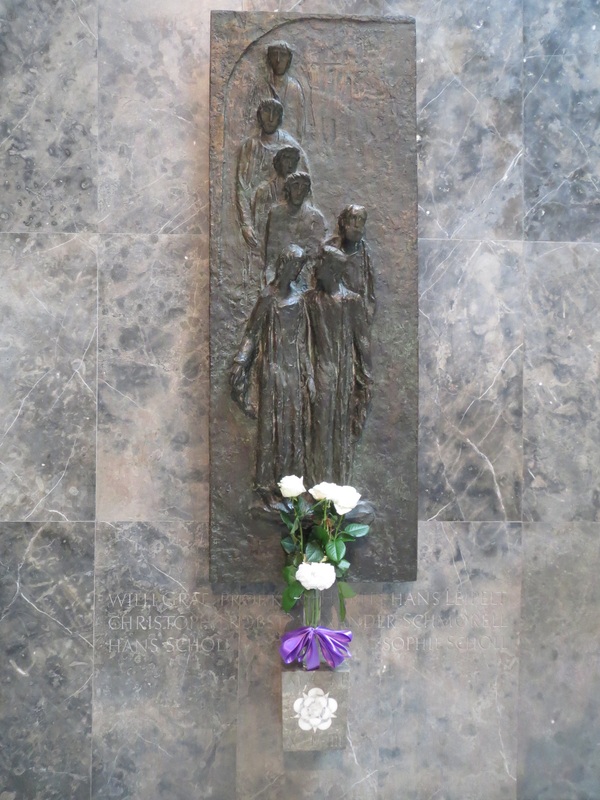 We arrived there on a drizzly, grey day, and spent the majority of the time walking around the perimeter, to the memorial sites from the Jewish, Catholic, Protestant and Russian Orthodox churches and to the crematorium. It was indeed grim; the Jewish memorial perhaps representing the bleakest building of all, with still decaying wreaths left from the 70 year anniversary. There is an extensive and excellent museum with audio from survivors but we only managed a short section of this and we left with heavy hearts. 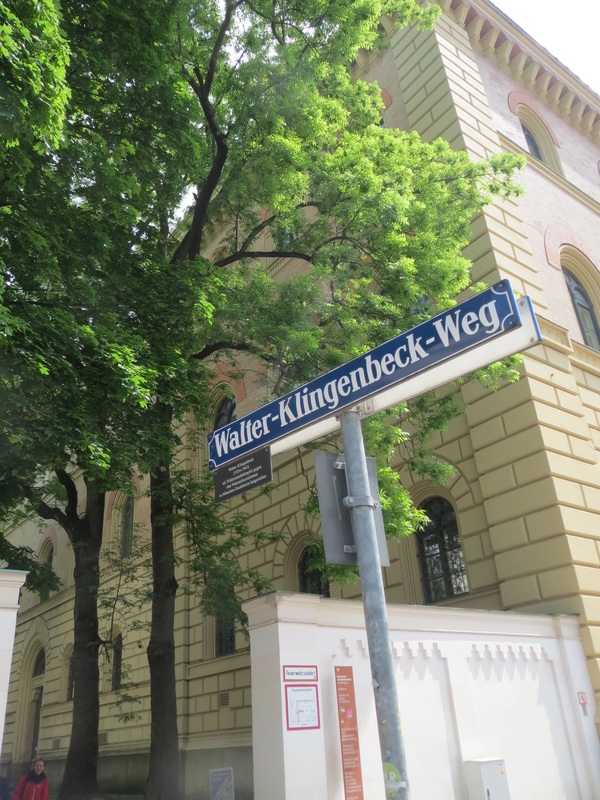 Weg (Walter Klingenbeck Way) commemorating the life of a 19 year old protesting student who was shot in the street behind the University. Right next to the LMU Universitaet subway station is the Geschwister-Sholl-Platz memorial – an unusual ceramic collection of leaflets. 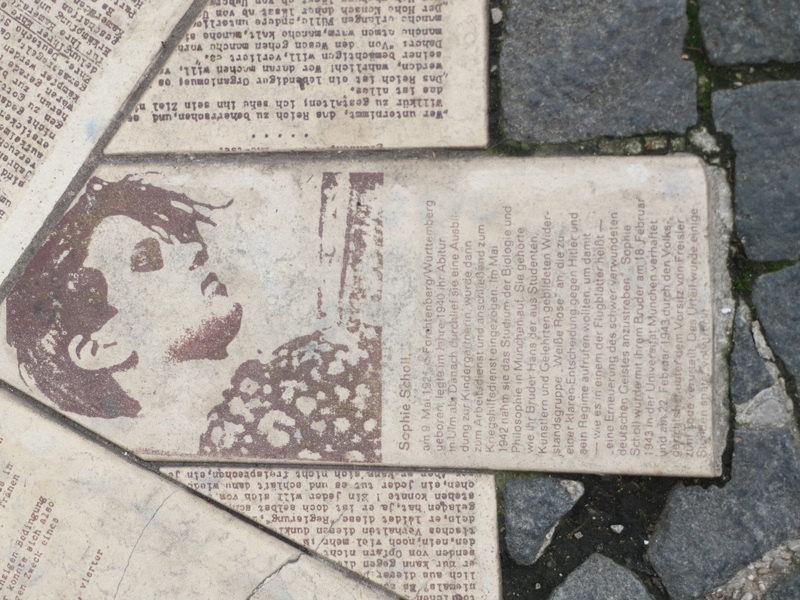 Sophie Scholl and her brother Hans were central to a student movement, Die Weisse Rose (White Rose) which promoted resistance to the Nazi regime via secretly written, printed and distributed leaflets. In 1943, having dropped off a suitcase full of leaflets outside student lecture theatres, Sophie in an act of youthful abandon, flung the last remaining leaflets out the window onto the atrium. She was observed, arrested, interrogated and executed along with her brother and philosophy professor, via guillotine. One hopeful outcome from this awful event was the smuggling of a draft leaflet out of Germany, which was rewritten, printed and 1000’s dropped over Germany by Allied aircraft at the armistice.